My Notting Hill: One Room Challenge: The Reveal! This is a painting I've been working on. It needs more layers and depth but I like the direction it's headed in. The desk was removed and this round table brought in. It really is a nice place to sit and read large sized books. After weeding out a ton a lot of accessories, I settled on pottery in blues and greens for the table. The peacock glazed jug was recently purchased from etsy and I am in love with it! The taller one was made by my son when he was a senior in high school. OK - part of the 15% still left to do is to HEM my drapes. Please excuse the thud-puddle! If you've been following along this last few months, you know I was on the fence about the floral. It's a departure from my usual. However, I'm loving the softness it adds to the space. Framed intaglios flank both sides of the french doors along with concete - in the shape of a sphere and lion. Hope to continue touches of concrete when I tackle the outdoor side yard. I'm really pleased with how the euro pleats turned out and love the unlacquered brass curtain rings from Rejuvenation. It was simple to sew them on since they have a swivel eyelet. Eventually I want to replace this rod with a custom, slightler longer one but for now it's working. Modern life - wireless router and phone are hooked up here. As you can see, I didn't get the herringbone insert done in time. However, here it is in the planning stages. I've already worked out a weathered wood glaze for it so hopefully I'll be able to show it to you in the next 2 weeks. I love the crisp feeling of my newly painted floors but they show. every. bit. of dust. and I have no short supply of it here. This spring I might paint over them with a geometric pattern in dove gray and taupe. What do you think? Sshh, don't say anything to my husband. 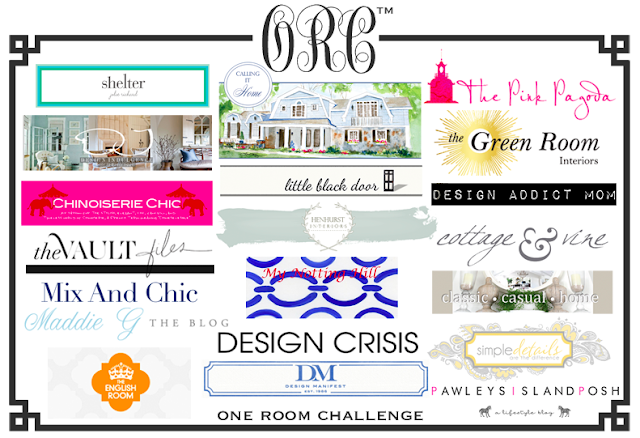 OK, Now I can't wait to see all the room reveals of the other 19 bloggers in the One Room Challenge. I know their spaces are going to be amazing!! Also, don't forget the ORC Linking Party on Calling it Home on Thursday. This fabulous graphic is by Jennifer of The Pink Pagoda. I'm going to miss posting it on my blog every week! Hi Michele, The room looks absolutely beautiful. I love the curtains and the intaglios, nice styling on the shelves, too! I will be following your decisions on the floor - because you know I want white floors as well. Have a great day! Oh, Michele, your dining room looks lovely. The combination of your abstract painting, the round table and the display of coffee table books is perfect. What a multi-function space. The intaglios, curtains and (future) fireplace insert are just icing on the cake. Congrats! What an absolutely lovely dining room. First, I love dining room/libraries. The wall color, your abstract painting, the curtain fabric, the intaglios are all perfect. A great job. I love it! Everything looks so great. The mirror over the fireplace just pops. And I love the idea of hanging art on your bookcase, btw the art you are working on is gorge and perfect for the space. I totally think you should paint the floor a geometric, it would be so fun! That turned out so good Michele. My favorite part is your painting. I love your idea of a bold geometric on the floor! What a transformation. I do love the light floors but bet they would be great painted in a geometric pattern too! love your idea of painting over the white!! the white is too pristine maybe? 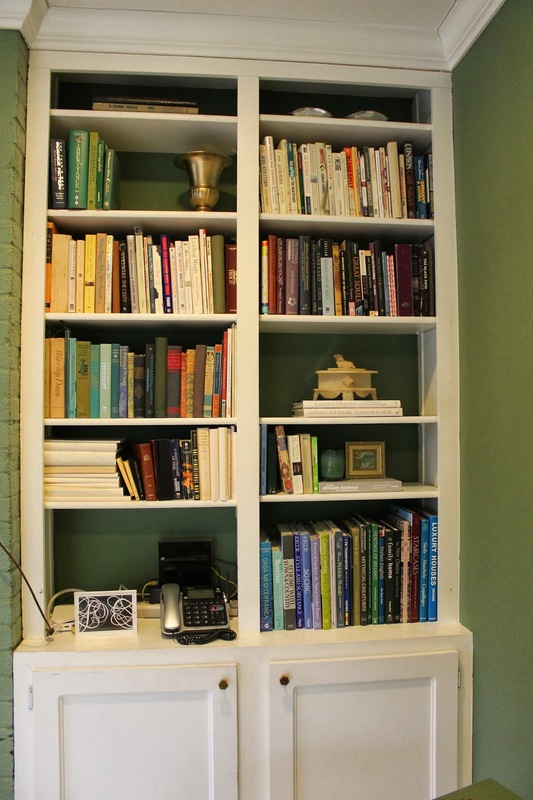 Also love the idea of hanging small pictures on the spine of the bookcase - layers! Agreed on the longer curtain rod but it's looking great now already. I think the space turned out fabulous. I love that piece of art....it just looks fabulous against the wall color. Great job! Beautiful transformation! Love that abstract art! Michele - i LOVE it. 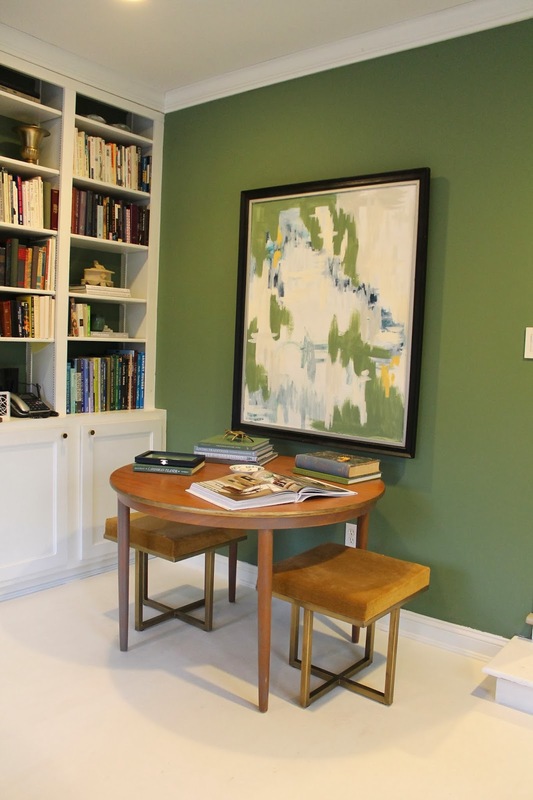 that table with the painting and benches looks so flippin chic! i love everything! your art is perfect too! Really great job!!! Love the art work as well it looks fabulous with the room color! Bravo Michele! It has all come together fabulously! I adore your work of art...wouldn't overwork it! LOve your idea for the floors! Love, love, love this room! From the green brick, to your artwork and fabric! I love it ! It looks great. I really love the painted floors and its good to know about the dust. May not be the best option for this girl with four fur kids. Great space! I love the painting already, but your the artist so you can surely know what's still missing! The floors look great to me already, but I understand the difficulty in maintenance, I have dark wood, and I do crazy seeing all the dust! Will check on your progress for sure! I love the floor and the floral fabric. I was saying to myself, 'I want white floors' and then I read your last paragraph. I'm not great at dusting, so this would not work for me. I look forward to the continued evolution of this room. That's what it is all about. Also, your art is beautiful. Great job. So excited to see your artwork for the space. Its looking great. You should do more. Beautiful job!! What a cozy dining room, I love the addition of the round library table and your abstract is amazing!! Your idea for painting the pattern on the floor would be fabulous! I think its looking spectacular. I love your abstract painting in the room and I love the floral drapes. I will be checking in to see how it all comes togther - I'm loving where you are right now!! The room looks wonderful! Love the details in this room especially the painting, floor, curtains and accessories. Looking forward to see the herringbone fireplace next! 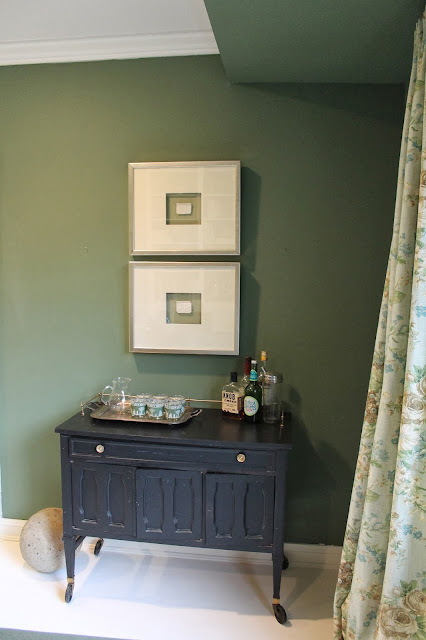 Love the stools and velvety mossy wall color. Great job! Oh yeah....wish I was there to pour us a drink from one of those bottles of liquor:) We deserve it. Michelle! It looks fabulous!! Your floors turned out beautifully. It just all came to gather perfectly. You had me at green and then you capped it off with the print curtains. You are right they just do great things for your room among so many great elements. I think your sons pottery jug is the pièce de résistance! I'd say thumbs up too for your secret spring project too. Bravo Michele, marvellous room; congratulations! Looks soo lovely! What a lot of work that is. Your painting is my favorite part, I think!! Love it!! Looks ready for holiday parties...nice job on the book shelves. The curtains really frame the beautiful nature just outside. Looks lovely. Perhaps you might find a sisal or a geometric rug for now - love that green. I have always thought that libraries and dining rooms should be together. Wen you are having witty conversations about old books you can turn to your huge old "OED" and instantly resolve it! Really nice job, Michele. The green was a brave choice right from the start and you've made it work. Totally in love with the drapes...and the painting. 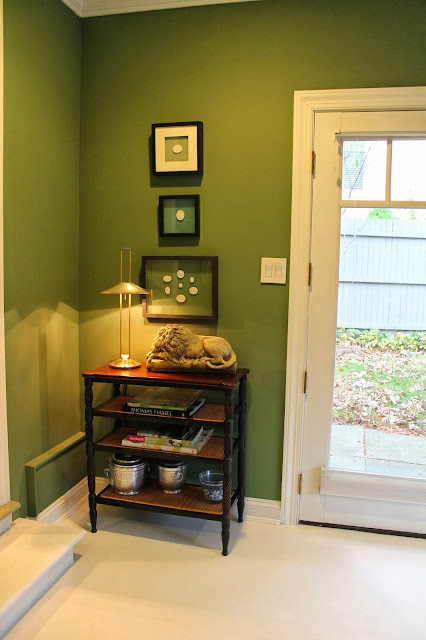 I do think the green in the painting needs a little variation the wall color but the composition and technique are really wonderful. That's not easy to make look good. The herringbone is genius. Can't wait to see that in place. Yeah, painted floors are unforgiving. That's why I'm looking for something with some variation. Just beautiful! I love your painting, and that green wall colo is fantastic! What a beautiful room. I'm really loving greens right now and I really like the floral curtains as well. Fantastic result, Michele!! Love it!! I have a huge thing for green interiors and you have done it with so many fabulous elements--the concrete, the intaglios, the painted floor. I love it as is but would think that a soft geometric painted overlay would be genius. Michele, it looks insane!! Love it. No criticisms from me - you don't need any help. Great choices and you have lovely taste. That painting is stunning. Leave it alone. Don't change it. WHERE did you get those stools at the round table? In LOVE with them! I also love your idea of hanging an intaglio in the middle of the bookshelf. That will look cool. And if you're looking for a great insert for the fireplace, The Brass Knob n Adams Morgan has great vintage fire screens! Great work Michele! The room looks fantastic, Michele. The wall color sings! Love your painting too. How did you find time to do everything?! Great job and it seems like you are further along. I love the painting you are working on. 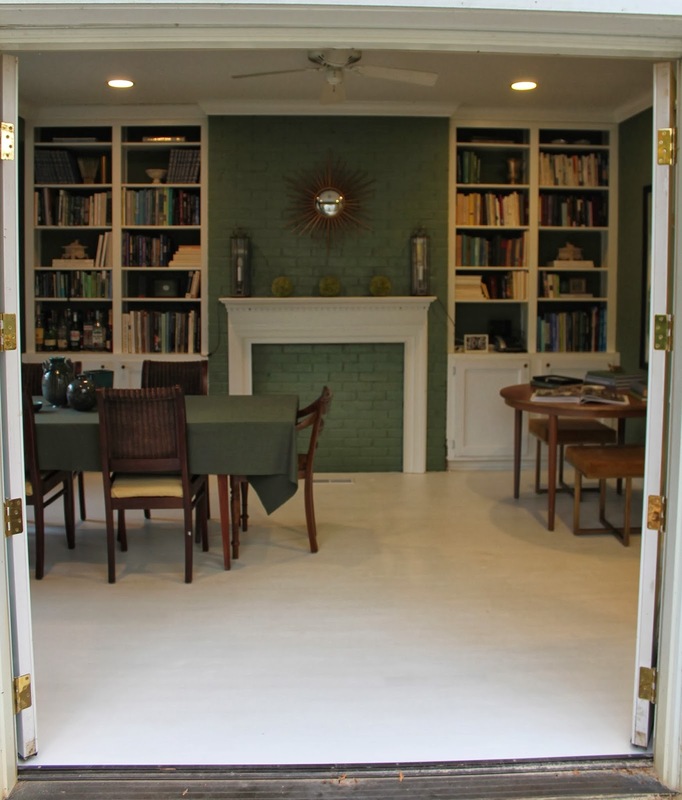 The floors are so different and balance the rest of the space, the walls. How did I not know that you paint?? Where can I see more about that? I absolutely love the addition of the drapes. I'm also dying over those benches. So amazing. Really love everything you've done, Michele! Looks so lovely, cozy and fresh. The bright white of floors adds such a great touch. Very nice! The pattern drapes lead the eye to the landscape outside and make a nice transition. 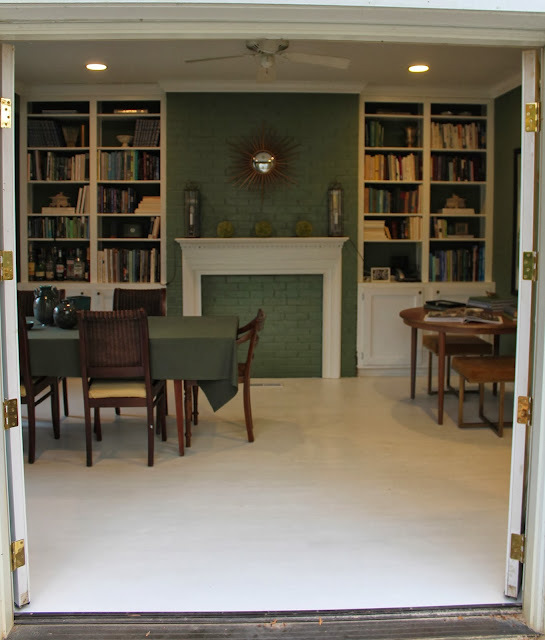 The white floors would worry me, but they look great. I could see the kids scuff marks from chairs real quick at our house! Good idea to maybe add a pattern. I note you have no overhead lighting. Neither do I since I'm using the living room as the dining room and my husband complains every meal about not seeing well. How's it working for you? Any suggestions? The floors made such a huge difference in the space and you know how I love those green walls! Your curtains are beautiful, you did an amazing job on them. And your bookshelves are so well styled. Great job all around!! Oh, the room is beautiful! Please give some details on that fabulous brass lamp in the corner when you have a chance. The curtains are beautiful against the paint! Love it! Also - your painting is great. I was expecting to hear you'd purchased it from a gallery. Those drapes are perfect in there! And I love the framed intaglios!! The room looks great! Love how the drapes turned out and really like the rings. So much talent in your family between pottery, painting, etc. Love all the details and look forward to seeing the herringbone. Well done! What a pretty room! Love the color choices and touches like the intaglios. 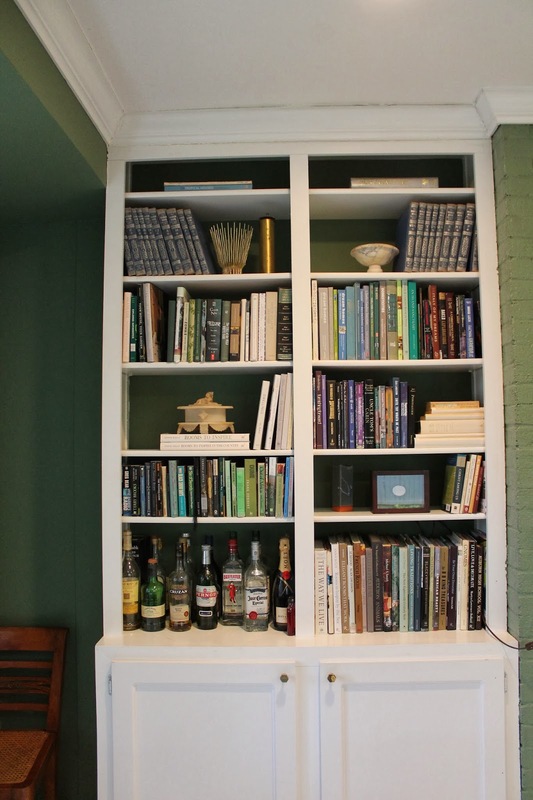 Love the idea of frames hung on the front of the bookcase and that herringbone insert is going to be amazing! Well Done! I love this! Love the color and the painting - and the library/dining combo - everything. great job. can't wait to see the floor!